I would never have believed that Kale, Beet and Berry Salad could be so awesome! Seriously? kale?? beets?? Yikes. Well, they work really well in this delicious salad. I added baby spinach leaves to tone down the kale and blackberries and raspberries to tone down the beets. The salad gets crunch from celery, carrots and bell peppers. The first time I made this recipe, I didn’t bother to photograph it because I wasn’t sure how it would turn out. Plus, I was super hungry and just wanted to throw everything together quickly and eat! M-I-S-T-A-K-E! It was so good that I decided to make it again for a lunch I was having with a friend. Served with Golden Beets Stir Fry, we had a super healthy meal that was completely filling and satisfying. The first time I used Romano and Parmesan cheeses. The second time I used Asiago cheese because that’s what I had on hand. You’ll see from the pictures that I served this salad with my favorite Jalapeno Cheddar Artisan Bread from Sprouts. I LOVE the stuff. I would eat it for every meal if I could–even when eating so much would cause my mouth and lips to swell from the jalapenos! Is that not overkill or what?? 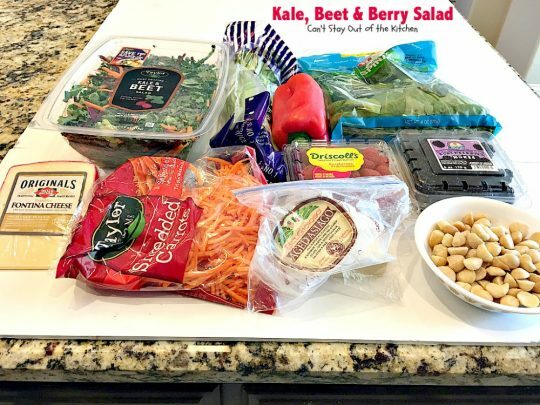 I loved the combination of flavors in Kale, Beet and Berry Salad. I found a kale & beet salad mix at Walmart and decided I just had to give it a try. 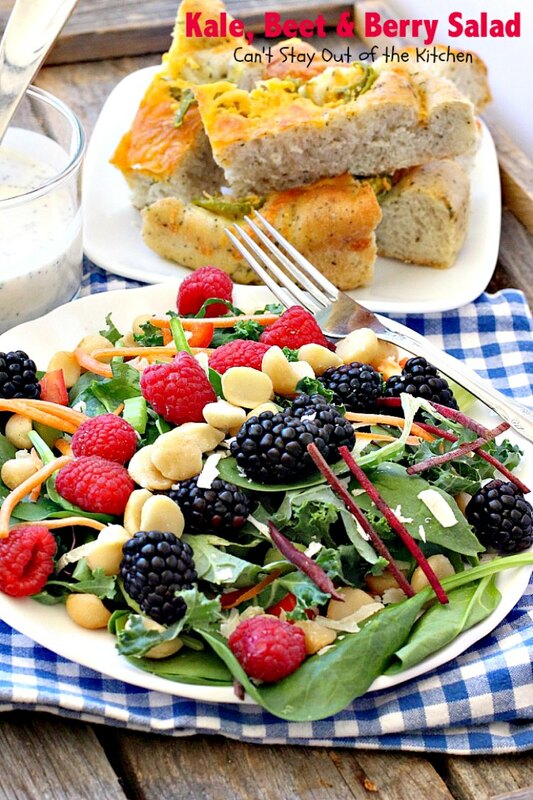 The fruit, nuts and cheese take this salad to another level. 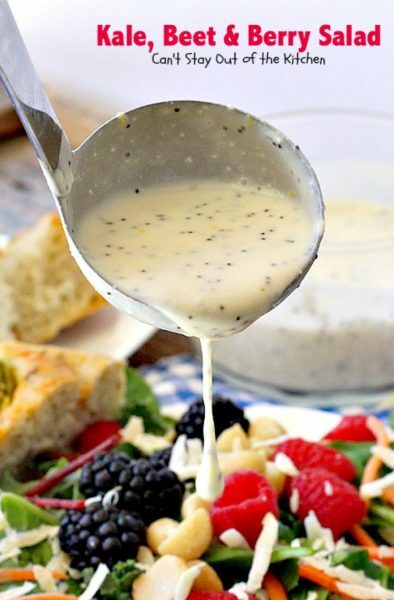 While my poppyseed dressing has a strong lemony flavor, regular poppyseed dressing works just as well. I also have orange, cranberry-raspberry and apple cider dressings that would be lovely on this salad. For that matter, a citrus vinaigrette would go be rather exquisite, I think. If you’re looking for creative ways to get your family to eat healthier, Kale, Beet and Berry Salad could certainly be your answer. 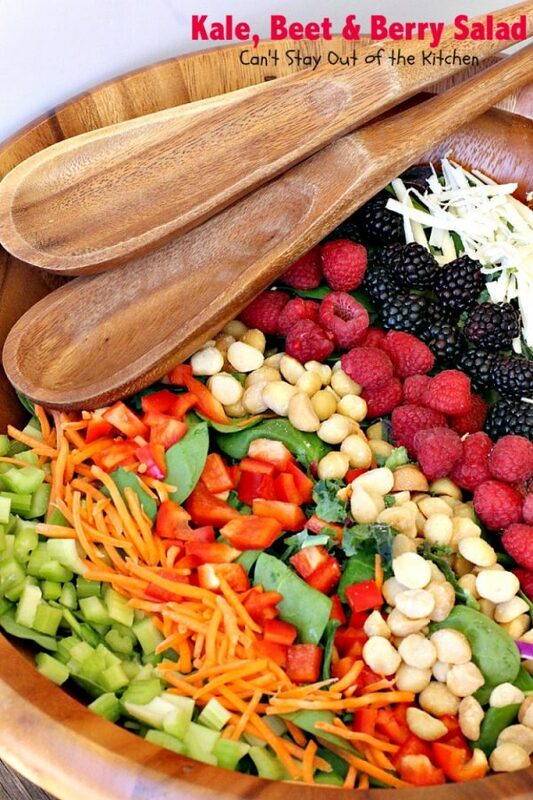 It’s full of antioxidants and everything great for your body. The salad not only looks elegant enough for company, it’s so tasty that you’ll find yourself coming back for second helpings! Kale, Beet and Berry Salad is fantastic. It’s also healthy, low calorie, gluten free and clean eating. 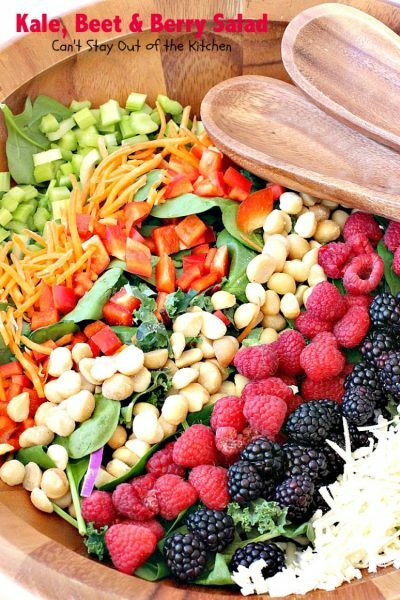 This salad is a great way to get your kids to eat their veggies! I used these ingredients, but did not end up using the fontina cheese. Taylor Farms makes the Kale and Beet Mix. I picked it up at Walmart. Combine the kale & beet mix with spinach and place in a large salad bowl. 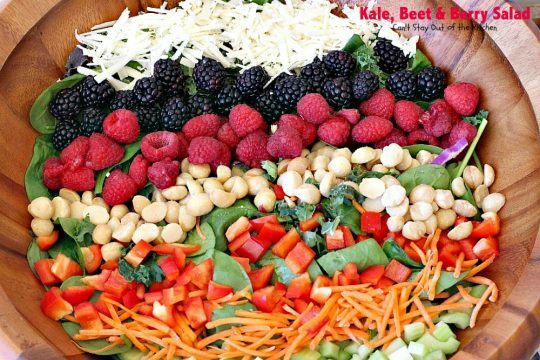 Layer celery, matchsticks carrots, diced red bell pepper, macadamia nuts, raspberries, blackberries and asiago or romano (or parmesan) cheese over top. Refrigerate until ready to serve. 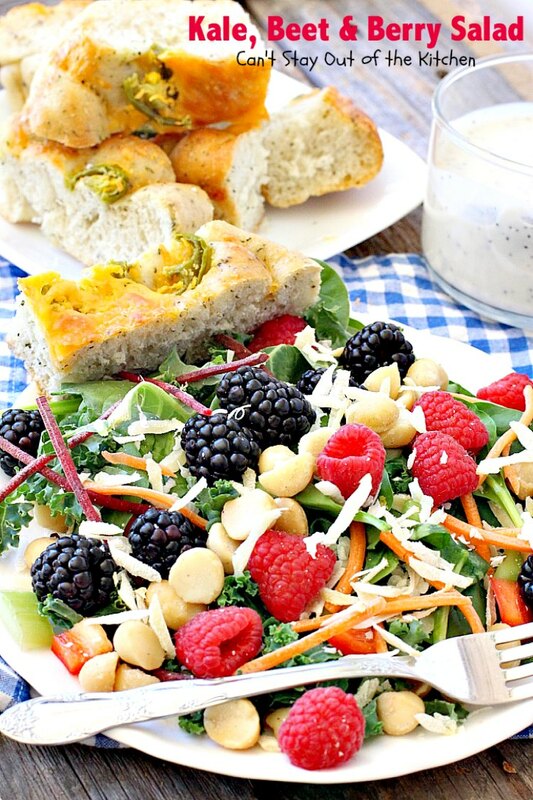 I served the salad with a batch of Healthy Lemon Poppy Seed Dressing. 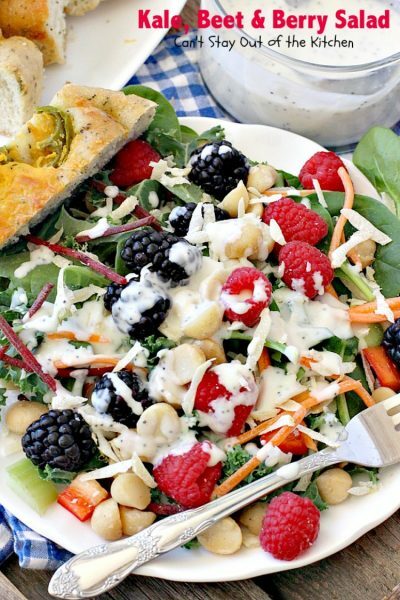 It has a strong lemony flavor which I love, but if you don’t want a lemony flavor on your salad, eliminate the lemon or use your own poppyseed dressing. 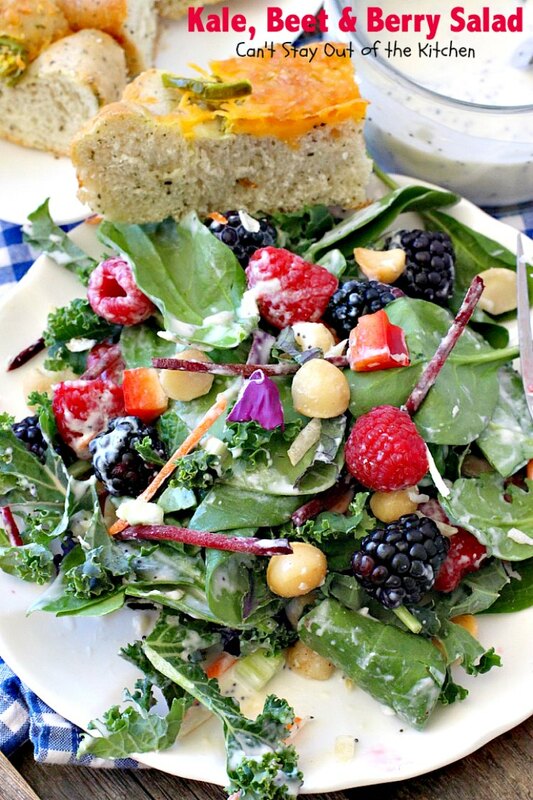 I served Kale, Beet and Berry Salad with Jalapeno Cheddar Artisan Bread. Oh, my! 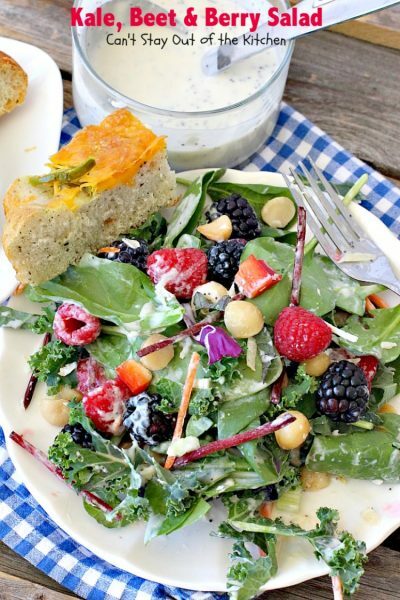 Adding Healthy Lemon Poppy Seed Dressing added a delightful lemony flavor to this salad. If you prefer a plainer dressing, almost any kind of dressing would work, but a fruity dressing or vinaigrette may work best. Every bite of this salad is mouthwatering. This delicious salad includes fresh raspberries and blackberries, macadamia nuts and asiago or parmesan cheese. Perfect for company. Healthy, low calorie, gluten free and clean eating. 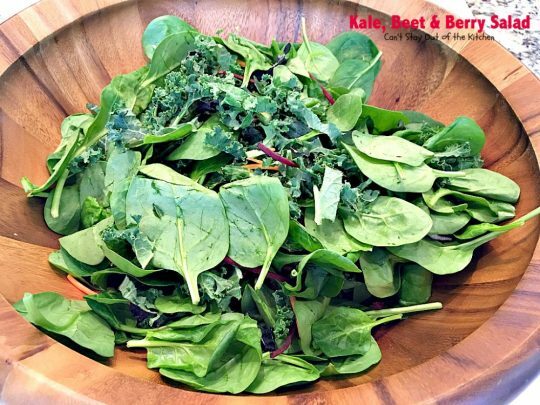 Combine kale mix and spinach in a large salad bowl. Layer with celery, carrots, bell pepper, raspberries, blackberries, macadamia nuts and cheese. 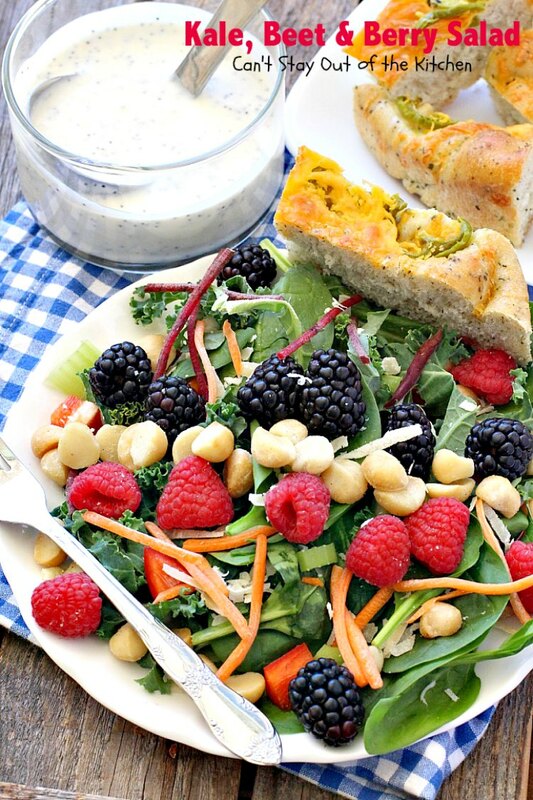 Serve each plate of salad with a dollop of Healthy Lemon Poppy Seed Dressing or your favorite poppyseed dressing. 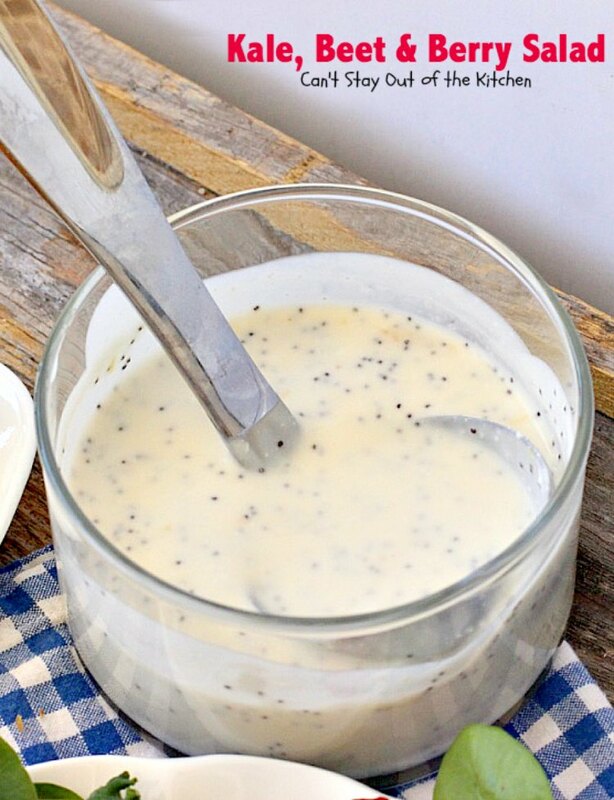 NOTE: Healthy Lemon Poppy Seed Dressing has a strong lemony flavor. You may prefer dialing back the lemon or trying your favorite Poppyseed dressing mix. NOTE: this is also good with sesame seeds. This healthy salad is nice and crunchy due to macadamia nuts, bell peppers, carrots and celery. I served this salad as a side for lunch with a friend along with Golden Beets Stir Fry. So wonderful. Kale, Beet and Berry Salad is awesome. It’s an excellent way to eat healthy, too. It looks delicious! I will try to learn cooking this recipe. Thank you sharing! Looks good to me! 🙂 I love beets!